HUGE SALE $199/N 4/22-5/3! Free Beach SRVC Heated Pool! Ocean Front! OCEAN FRONT! MILLION DOLLAR VIEWS! We had a great trip. The condo was very nice. The views can not be beat. Easy to get to beach and pool area. We had an awesome experience. We had a lot to celebrate ( MPH graduation and 2 birthday's celebrations). My cousins flew in from Texas and then we took a road trip to Destin from Atlanta. Julie with Marsha Adamson Properties was very helpful. I was impressed in how much communication I had from them. They were very attentive and followed up on us to make sure everything was OK. Even though we went during the weekend when Hurricane Nate decided to visit us, we had a great time. We definitely made it work. This was the first time we ever experienced a storm of this kind, however Julie and the resort staff did a great job in communicating safety procedures and making us feel safe. We enjoyed the condo very much. It was very clean and modern. The view is breath taking and the balcony had plenty of space for all of us to relax and enjoy the view of the ocean. Furthermore, the kitchen has everything you need in order to cook your meals and enjoy family meals in the dinning area. I will definitely come back to Marsha Adamson Properties for my family vacations. I love Destin Florida, my favorite vacation spot! Thank you Marsha Adamson Properties for the great experience, see you next year! What a find!!!! So great to walk in and you are staring at the BIG BEAUTIFUL BLUE GREEN OCEAN. Complete view all around. We wanted a great place to visit and we have sure found it. The unit was nicely appointed with the comforts of home. It was very clean. Our teenagers were very happy because they had not only the beautiful beach but a nice pool, two hot tubs big enough to put both of our families in and Sauna. We were able to walk to several of our meals. Another wonderful thing was the time of year that we went. The weather that week was in the Mid 80's. There was a couple of mid 70's. Another thing that made our trip fun was the two girls that we booked with. They provided us with all kinds of information about the area. My wife was especially happy because we were able to go to some great places to eat. We have already recommended this place to a couple of our friends. Will we come back? You bet. We are trying to book for fall break next year. Thank you for taking the time to write your review. We really appreciate your kind words. Soooo glad that you liked the condo, Surfside Resort and had a great vacation. Our team is very focused on our guests to insure they have the best vacation experience possible. Our team is also focused on making sure our units are the best they can be for our guests. Please call on us again, we will take very good care of you and your family. Beach Blessings. My 3 friends and I booked this 3 bedroom condo for a girls trip week. From the first day we experienced the following problems: room not cleaned properly..sand on floors, dusty, glass on bathroom floor. Lights not working, dishwasher not working, kitchen and bathroom sinks not draining, terrace doors not opening, wifi not working, beds too soft no support, shower doors ready to fall in shower, rooms w poor lighting, light bulbs left at condo all old and not working, very few hangers, only 2 beach chairs for a 3 bedroom, a/c not working in one bedroom. Owner called Maint for us but for 3 days we had Maint in and out of our unit and finally gave up and just lived with some of the issues for the week. I asked for a 1 night refund for all of the issues and was told NO. This is the first time in eight (8) years that we have had a negative review on this fabulous unit. We are “very customer focused” and make every effort to make our guests’ vacation a fabulous experience. All of the complainant’s issues were “immediately” addressed. From the get go, the complainant wanted a refund. She said that if I didn’t give her a refund that she would post negative reviews on the internet. Later in the week one of the ladies vacationing with her (the lady that actually rented the unit from us) contacted me and apologized for all of her friend’s actions. She said that this was the first time she had vacationed with her. Please see the reviews posted by other guests on this property. All reviews are ***** "FIVE STARS". Please feel free to also check reviews on all of our properties. You will see that our guests are extremely pleased with our properties and our attentiveness to our guests. Full gulf and partial bay views on wrap around deck! This is the second time we have booked with Marsha & Cindy. We had one small issue and I called them for help and they took care of IMMEDIATELY. The condo was exactly as it appears in all of the pictures. I can’t describe the views from unit 1202 they are unbelievable. 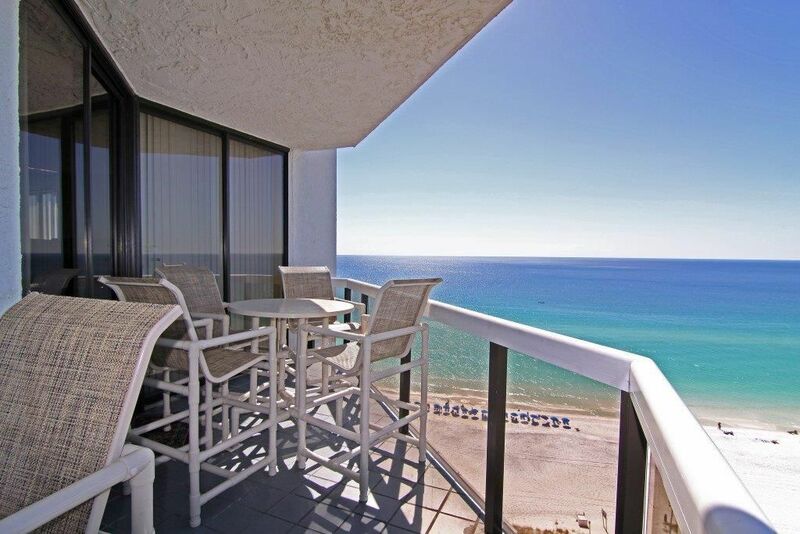 I loved being able to wake up every morning and watch the dolphins right from our unit. I can't say enough great things about this condo. VERY short walk to the beach was easy with a two yr. old. Surfside is in an awesome location with plenty of golf courses, restaurants in walking distance and of course the beautiful, white sand and emerald green waters. We also loved the Surfside’s new restaurant “Royal Palm Grille” The food was excellent! My whole family loved every minute of our vacation. We already booked for next year.